Layout construction started in 2004 and took 3 years to complete the orginal three level design. This work was illustrated in Part I DVD. In 2009, an extension was added to the front of the layout and took about 1 year to build. This was the theme of Part II DVD. Finally, in 2011 the urban area was replaced with a new, larger and more elaborate urban scene including construction of an elevated subway. This work took 1 year to complete and was captured in Part III. The layout is a scale O-gauge 3-rail or hi-rail layout. The main (middle) level is 35" high from the floor. To minimize grades, levels are separated by only 6.5". Maximum grade is 2.5 degrees. All the track and switches are ScaleTrax by MTH. This track was chosen because in my opinion it was the most realistic looking 3-rail track available because of the low profile rails and thin center rail. 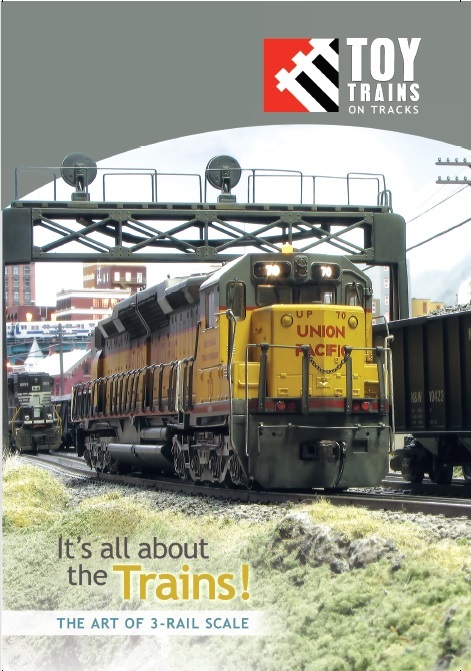 Click Here to read answers to FAQ about ScaleTrax. There is approximately 700ft of track over four levels. Thats 33600 scale feet or about 6.4 scale miles! There are 35 switches used on the layout, mostly #4 and #6 switches. The minimum radius curves of the main layout (not the elevated subway) are 36" or O-72. MTH DCS is the main control system which controls the MTH engines, switches, accessories and isolated track power. 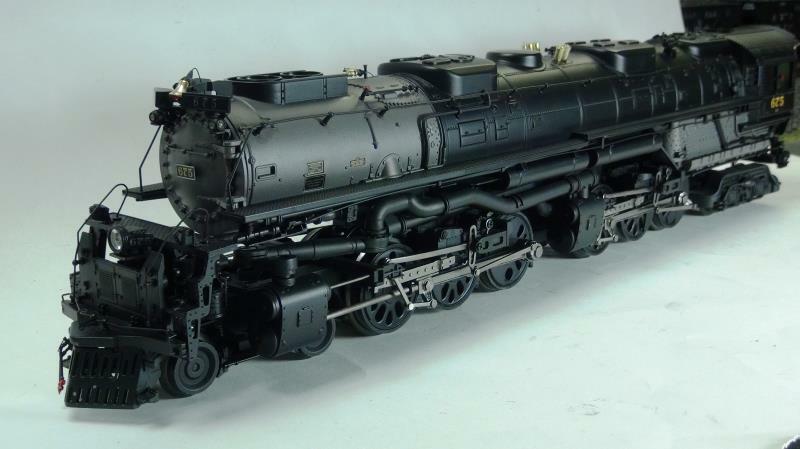 Lionel Legacy and TMCC controls all the Lionel and TMCC compatible engines. The layout is modeled after the Mt. Carmel PA area coal reqion where coal or "Black Diamonds" was king. 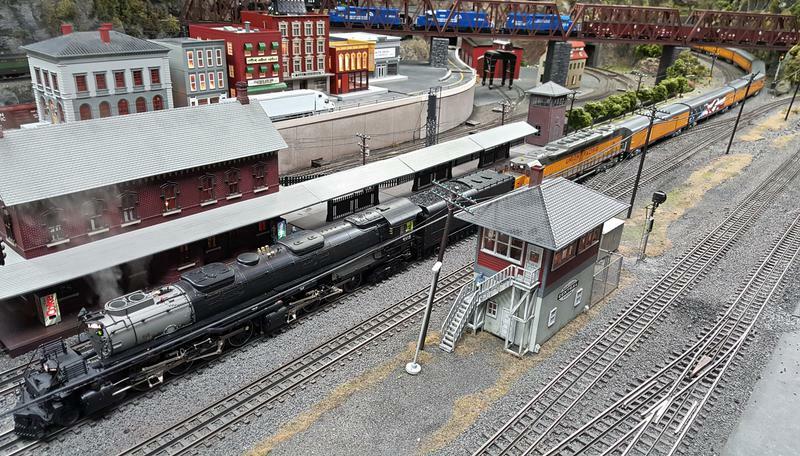 Although there are no exact replicated scenes, the buildings, mountains and ground cover reflect the look and feel of the coal region area. In fact, the ground cover on the layout is real rock collected from old coal roads in the coal region. 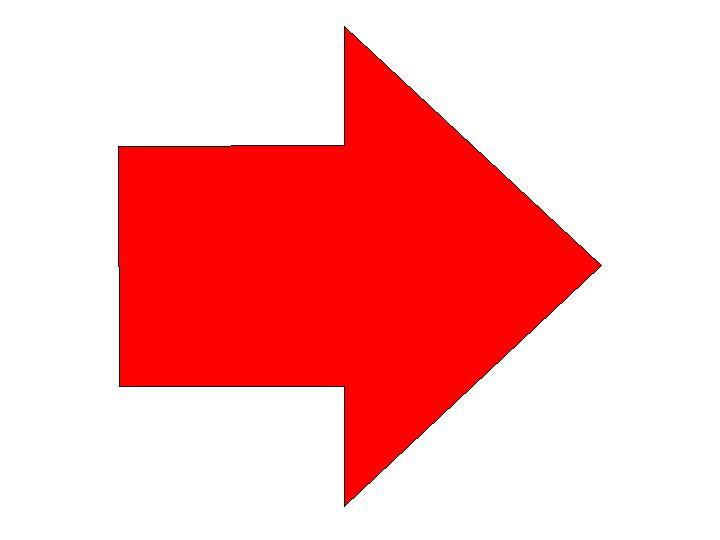 Only one MTH Z-4000 powers the main three levels. A separate Z-1000 powers the elevated subway. Usually I have no problem running as many engines as I want except when I run multiple passenger trains. The lights from the passenger car consume much more power limiting the number of trains I can run. Not much of a problem for me because I like to run freight. Almost all the buildings are from MTH. However, recently have been adding some of the new Woodland scenics buildings. This consists of the Lionel Visionline Big Boy, DD35 (with fixed pilot) and the new 21" passenger cars. The 3-rail couplers were replaced on the passenger cars by mounting Kadee couplers to the kinematic coupling mechanism which provided the closest separation possible while working reliably through curves. Check out our latest video! "It's All About The Trains!" As always I buy the 2-rail version of MTH diesels and operate them on my 3 rail track. The main reason is the fixed pilots, full length handrails and scale wheels look much more realistic in my opinion. This is the first time I've run a double axle engine, the GP40, through my switches and it worked with no problem except a small bump or dip which you can see in the video. 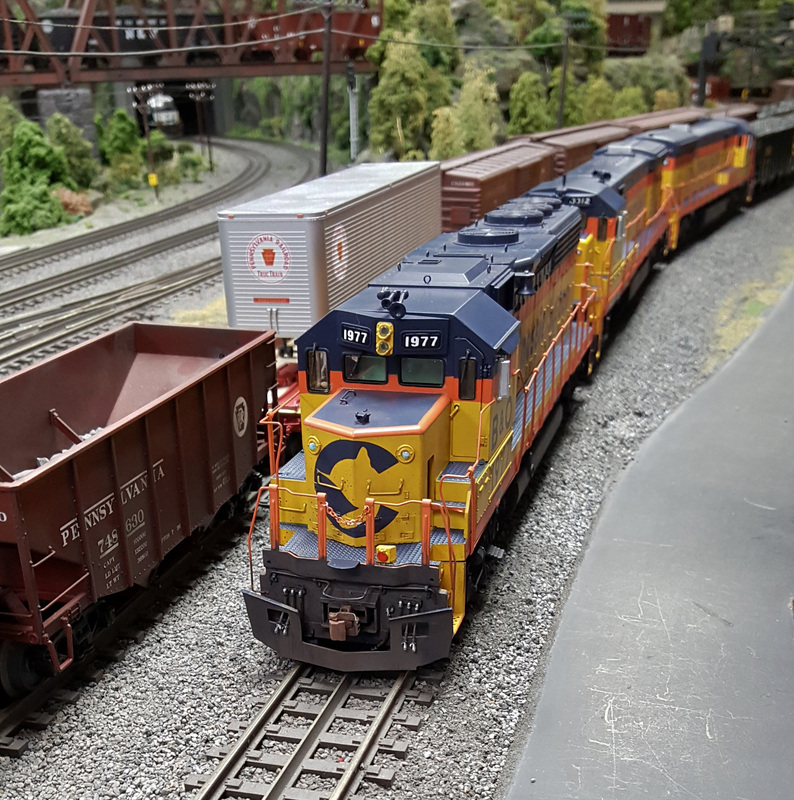 The GP40 and U30C had the trucks moved in, adjusted the snow plow, painted accents on the hoses and of course weathered them.